Here is an interesting historical fact. Just have a look at the calendar for the month of September 1752. 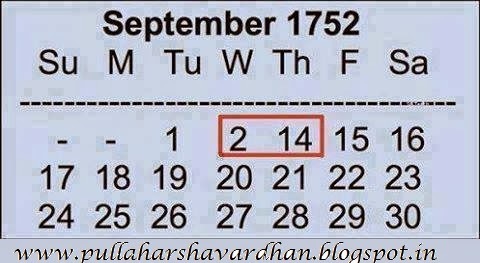 Go to Google type "September 1752 calendar" & see for yourself. You will notice, 11 days are simply missing from the month. Here's the explanation: This was the month during which England shifted from the Roman Julian Calendar to the Gregorian Calendar. A Julian year was 11 days longer than a Gregorian year. So, the King of England ordered 11 days to be wiped off the face of that particular month. So, the workers worked for 11 days less that month, but got paid for the whole month. That's how the concept of "paid leave" was born. Hail the King!!! In the Roman Julian Calendar, April used to be the first month of the year; but the Gregorian Calendar observed January as the first month. Even after shifting to the Gregorian Calendar, many people refused to give up old traditions and continued celebrating 1st April as the New Year's Day. When simple orders didn't work, the King finally issued a royal dictum; which stated that those who celebrated 1st April as the new year's day would be labelled as fools. From then on, 1st April became April Fool's Day.